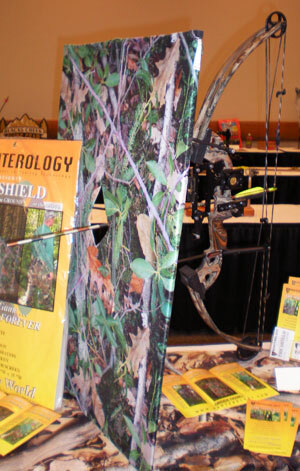 Each year at the ATA trade show, archery manufacturers display new, never-before seen (or thought of) products for bowhunters. 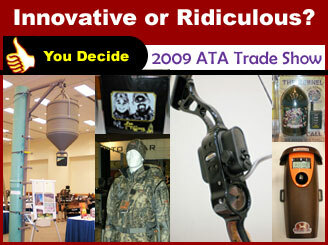 Some of these products may be considered truly innovative, practical, controversial, outrageous, or just plain ridiculous. You are the consumer, so you decide your "first impressions." Where available we included the MSRP. By design we are providing you with a very limited amount of information on these products to gauge first impression. The very best way to judge a product is to learn as much as you can about it, see it, try it, listen to others and then make an informed decision. Just because the first impression is positive does not mean the product is worthy, the inverse may also be true. 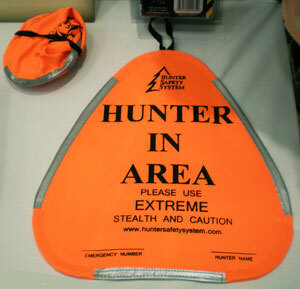 For the hunter who either wants to, or is required to hang a blaze orange marker on a tree or next to a ground blind. Collapses to a small size and expands to a triangle visible from both sides. 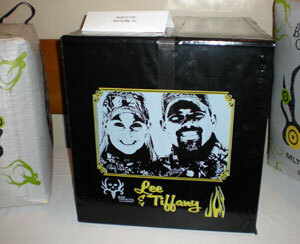 This is a sponsored broadhead target featuring an image of Lee and Tiffany on the side. Measures 22" x 20" x 18" and weighs: 20lbs..
RIPshot allows archers with arm injuries to get back to shooting by taking the pressure off the arm and focusing it on the back. Allows women and kids to pull more weight and also allows all archers to perfect their shots by focusing the pull on the larger and stronger back muscles theoretically reducing punching. 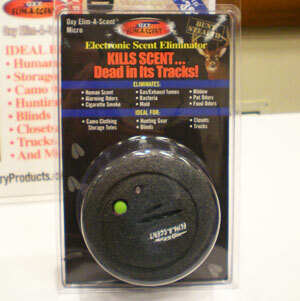 This product is small enough to be placed in a closet, blind, truck, bin, etc. 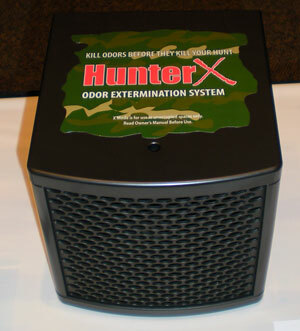 Uses a patented process to eliminate the bacteria that produces odor. According to the manufacturer you place your soiled clothing into an enclosed environment, turn on the unit and in a few hours your clothing is scent free. With the Archer Range, if you know how high you are and the angle down to the target, you can know the distance. Using ArcherRange is very similar to using a laser rangefinder; aim, press a button and read the distance! The ArcherRange does all of the calculations. 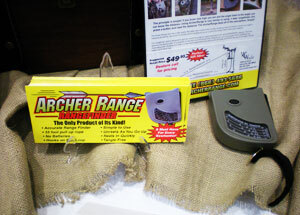 The archer range also includes a 33' pull up rope which is also a tape measure. The Shield - by Hunterology. 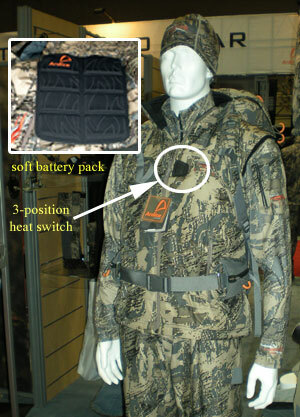 Provides for a lightweight camo shield which folds up for easy portability. 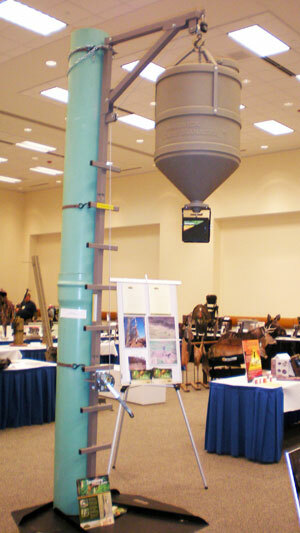 Other interchangeable screens are available in various patterns depending on terrain and cover. 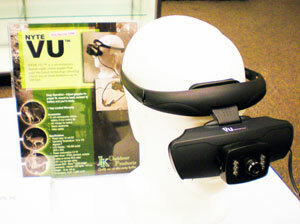 Nyte Vu goggles are a digital night vision goggle that uses the latest technology allowing you to see in total darkness. 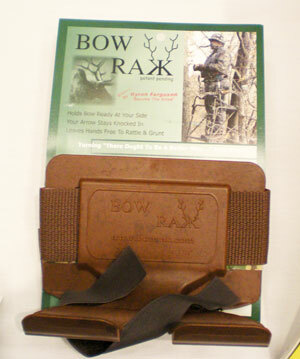 BowRak allows you to conveniently and comfortably hold your bow at your side, keeping it with you at all times as you change your position. Your arrow is knocked in and ready to go. The BowNear retracting bow arm can be set to not rise at all when the bow is removed or rise up as slowly as you want it to by adjusting a knob at the base of the arm. 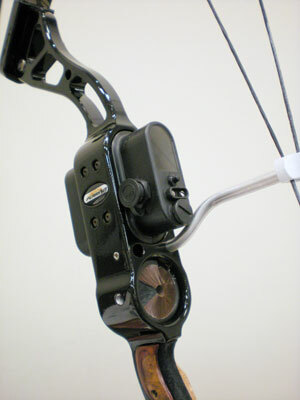 The arm is hinged in the middle and can swing up to 270° from left to right so you can position your bow where you want it. 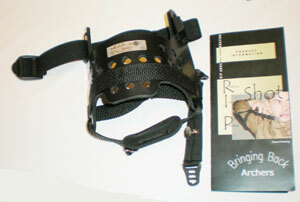 Modular accessories and different mounting systems available. With just a standard 18 volt drill you can reach a height of 15’ in less than 60 seconds. Can be pulled by hand or behind an ATV. 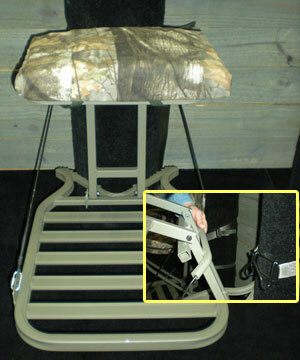 Designed for young, old, disabled or people who would rather not climb into a treestand. 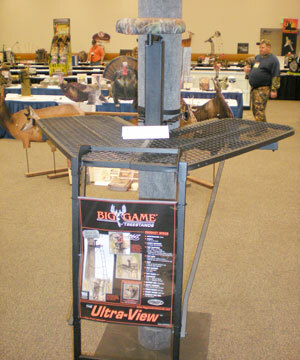 This steel ladder stand allows for 360 degree shooting around the tree by using a large, V-shaped foot platform and a swivel seat that sits 15' above the ground. Stand weight is 60lbs and is rated to 300lbs. Built to accurately simulate the sound of a feeder going off. 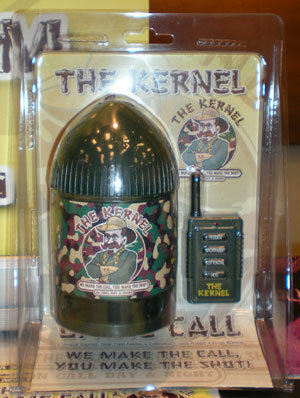 The kernel uses a wireless remote that can control the sound unit (up to 100 decibels) up to 100 yards away. Comes with four different sounds including Feeder, jack rabbit, cottontail, hogs wailing. The Elim-A-Scent utilizes an electronically produced combination of natural cleansing activated oxygen and healthful negative ions (Oxyions) to safely destroy all bacteria nd non-bacteria scent/odors, mildew, mold, pollutants and more. This process of deodorization leaves only natural oxygen as its byproduct. 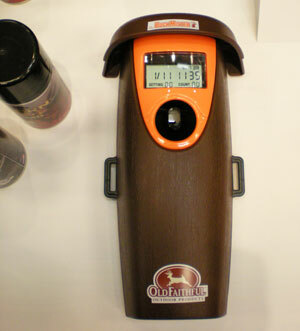 For use with the Buck Bomb spray cans, the Buck Mister is a programmable scent dispersal system that can be pre-programmed for up to 99 scent dispersal times. Runs on C batteries, Buck Bomb scent canister not included.. 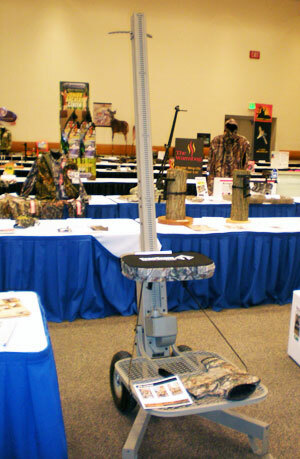 The Game Manager Combines a feeder and hoist system in one complete package. 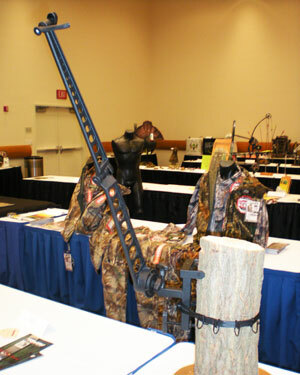 Allows you to hoist your feeder up to 7' from the ground, above the reach of bears, thieves, and vandals. Hoist can support up to 400lbs and provides 3 lockable points for security. New for 2009 is a line of quick attach/detach hang on stands that feature thick padded seats, and a rubber coated silent hanging system that can be purchased separately for using the same platform across multiple stand locations. The stand is available in large and small, aluminum or steel, and traditional (shown) or with a padded seat and padded back-rest. Adjustable for leaning trees and very lightweight. SEEMZ’s T.H.E.E. 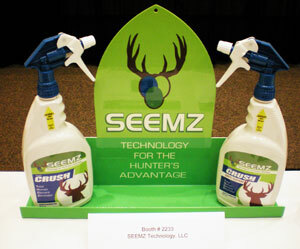 CRUSH is a scent control/cover scent spray that traps and eliminates odors. The new deliverance from Ben Pearson Archery features an integrated sight with range finder which provides an unobstructive view and the exact distance to the target. Unique center shot design with an integrated whisker rest. The Dragonfire Thermo Grip places the battery unit inside of the insulated, weather-resistant and vibration dampened 7.2 oz stabilizer bar, a self-adhesive heating element wraps around your bow's factory grip and provides choice of two heat settings. Turn on the heat with the flick of a switch. Integrated heating panels are powered by a lightweight soft, rechargeable battery pack with settings of Off, Low and High. On a fully charged battery, the Dutch Oven provides heat for up to 8 hours. An integrated USB cable can be used to power or recharge your cell phone, IPOD, or other electronic device right from the vest power. 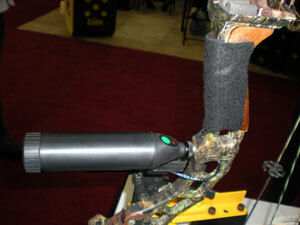 Vest made of lightweight, ergonomically designed materials using Gore's Optifade camo pattern.